(Last Updated : 11.04.19). 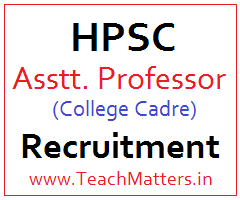 Check HPSC Assistant Professor (College Lecturer) Recruitment 2019 Online Application, Syllabus, Exam Pattern & Result for College Lecturer Screening Exam 2019. HPSC has invited online application for recruitment to 524 posts of Assistant Professor (College Cadre) in Higher Education Department, Haryana. Eligible and interested candidates may apply online from 15.03.2019 to 15.04.2019 through official website of HPSC i.e. www.hpsconline.in or www.hpsc.gov.in. Here you can check recruitment details like - result, answer key, vacancy, qualification, age limit, application fee, syllabus, exam pattern, screening exam schedule, admit card etc. For eligibility criteria and qualification details check the previous advt. no. 7/2014 here or visit official link or download the original advertisement. Candidates can apply online for these posts of HPSC College Lecturer Recruitment 2016 through official link of HPSC Online Application up to 15th April, 2019. Exam Pattern & Syllabus for Assistant Professor / College Lecturer Screening test 2019 is available at official website of HPSC. Candidates who are appearing in the written test can also check previous question papers of HPSC Assistant Professor recruitment. HPSC Syllabus for all 29 subjects for Assistant Professor Written Exam 2019 are given below. Candidates can visit the main link for syllabus of all subjects or can download the syllabus of particular subject they have applied for through the link of subject-wise syllabus. The commission has already conducted Recruitment Test for the post of Assistant Professor (College Cadre) English, Economics, Home Science, Public Administration, Computer Science, Sociology, Hindi, History, Maths, Psychology & Geography Commerce, Sanskrit & Physics. The official answer key of Assistant Professor English, Economics, Home Science, Public Administration has also been released by the Commission. Check here Fresh/new dates of recruitment test. Haryana Public Service Commission (HPSC) released result, answer key, exam pattern & date of Recruitment Test for the post of Assistant Professor (College Cadre Lecturer) against the advt. no. 10/2015. HPSC is holding written exam for 1647 Posts of Assistant Professor (College Cadre), HES-II from 30th June, 2016 onwards in various subjects in Higher Education Department, Haryana. HPSC College Lecturer Admit card 2018 are available at the official website of HPSC i.e. www.hpsconline.in or www.hpsc.gov.in as per the schedule. HPSC has released Exam Schedule of Assistant Professor Recruitment Test for the subjects - Philosophy. The Commission has already conducted Assistant Professor Recruitment Test for the subjects - Maths, Psychology, Chemistry, Political Science, English, Public Administration, Economics, Home Science, Computer Science, Sociology, Hindi, History, Mathematics, Psychology, Geography, Commerce, Sanskrit, Physics, Zoology, Fine Arts, Botany, Music (V) and Physics, Defence Studies, Punjabi, Mass Communication, Music-I & Geography, Sanskrit, Bio-Technology, Physical Education & Tourism for the post of Assistant Professor against advt. no. 10/2015. The exam has been started from 30th June, 2016 as the Commission has released exam date for Assistant Professor Recruitment Test 2017-2018. Subject/paper-wise exam dates have been uploaded by HPSC on their official website. HPSC released recruitment/screening test result of Assistant Professor written test in 2017-18 for various posts. Candidates can check their result and interview schedule at the below link. Admit cards for HPSC Assistant Professor exam 2018 can be downloaded here as and when admit cards are available at the official website. Candidates can download their admit cards for HPSC College Lecturer Screening Exam 2018 as per the schedule at the below link. Check official answer key of Assistant Professor Screening exam 2016-17-18 for various posts and subjects. HPSC has released official answer key of various posts so far. Download the answer keys at the below link. Refund of Application Fee - HPSC on 30.12.2016 issued a notice regarding fee refund of candidates of Assistant Professor (College Cadre) in the subjects of Microbiology and English (General Category). As these posts have been withdrawn by the commission, HPSC refunded application fee for these posts. But some Demand Draft of Refund Fee have not been received in Banks by the candidates. So these candidates can received their application fee up to 19.01.2017. HPSC announced for the information for BC candidates, who had earlier applied under BC category for the post of Assistant Professor against advt. no. 7/2014, that the Govt. vide notification dated 15.07,2014 has converted the BC category into BC-A & BC-8. There are 1055 candidates who have not updated their category as BC-A or BC-B. Now these candidates can updated their BC category up to 12.06.2016 otherwise their candidature will not be considered by the Commission. Here is the detail. HPSC on 16 February 2016 advertised 1647 posts Assistant Professor (College Cadre) for recruitment in Government Colleges in the state under Higher Education Department of Haryana. 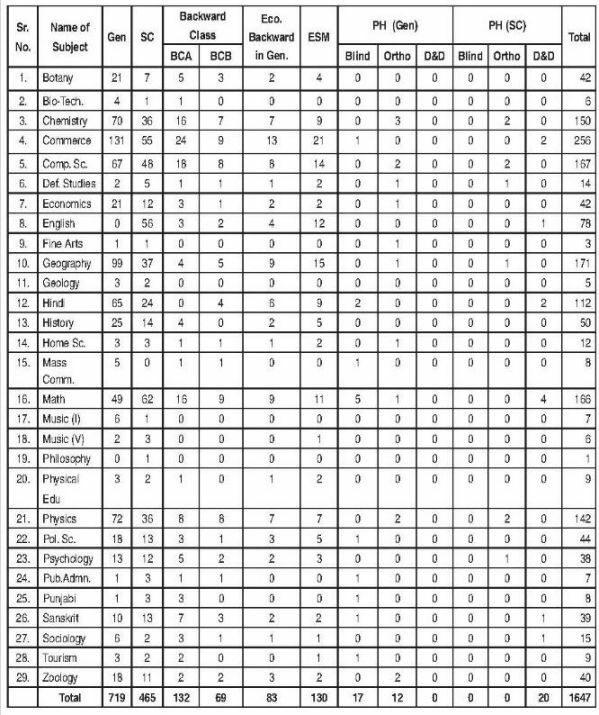 1396 posts of these posts were advertised earlier under HPSC Advt. No. 7/2014 dated 24.01.2014 which were further withdrawn by the Government. Haryana Government New Pension Scheme will be made applicable. HPSC on 01.03.2016 issued corrigendum regarding age relaxation for reserved categories for this advt. no. As per the Govt. norms, 5 years age relaxation is admissible to the Scheduled Castes, Backward Classes and EBP (Gen.) category candidates and accordingly they are eligible upto the age of 47 years. Candidates can apply online for these posts of HPSC College Lecturer Recruitment 2016 through official link of HPSC Online Application up to 10th May, 2016.